The Border Security Force (BSF) recovered five kg of heroin, valued at Rs 25 crore in the international market, from near the India-Pakistan border in Punjab, an official said on Friday.The seizure was made in the area of Border out Post (BoP) Daoke in Amritsar sector, a BSF spokesman said.He said BSF troopers noticed suspicious movement of Pakistani smugglers near the International Border near the border security fence. The smugglers reached near the fence and started throwing something over the fence. "The troops challenged them to stop, but the smugglers continued with their aggressive posture. To stop their misadventure further, BSF troops opened fire. 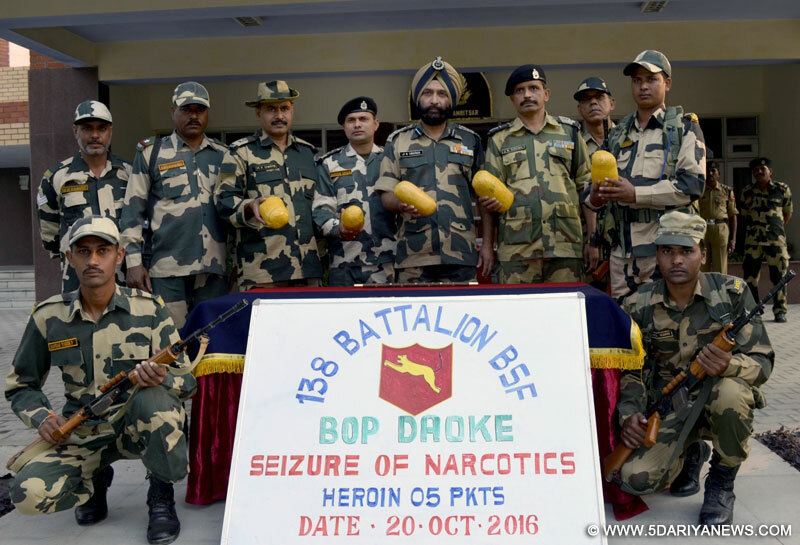 However, the smugglers managed to escape taking cover of thick vegetation, undulating ground and darkness," he said.A search of the area led to the recovery of the heroin consignment.The BSF has seized over 206.6 kg of heroin along the Indo-Pak border in Punjab this year. Its value of the seizures is over Rs 1,030 crore in the international market.Punjab shares a 553-km-long international border with Pakistan.